Even though this has been a two day work week for me, I am still so happy it’s Friday! I have a fun-filled weekend ahead but it is going to be a busy one. First things first, long run on Saturday morning with Mugsy. Our training schedule calls for a 10k race this weekend. I never thought this would be a problem. There are zillions of races this time a year but apparently not one when we need it. HOW IS THERE NO 10K THIS WEEKEND? I’m shocked! Mugs and I have to adjust. New Plan: Run a faster then usual 6.1 mile loop on the half marathon race course. Before I get too far ahead of myself with weekend activities, let me offer up a few of my favorites from this week. First of all, props to Logan Airport for having some amazing airport snacks. I packed some of my own plane snacks but when I saw my first two Favorites on this week’s list, I couldn’t resist buying them. I first heard about these delicious little nuggets from Tina of Carrots ‘N’ Cake. When I saw them in the airport a few days after seeing them in this post I knew I had to try them. I picked up a bag of the Lemon flavored treats and tried them immediately. Instant love! I can’t wait to try all of the other flavors. Another awesome airport find. I have seen these in the Pinterest world before but I haven’t seen them in the stores I shop at regularly yet. Epic makes 4 types of bars (Bison, Beef, Turkey and Lamb) abut I chose the bison type which has bacon and cranberries. It was amazing. I loved that it wasn’t as hard to chew as normal beef jerky. The 1.5 oz. bar was gluten free and had 11 grams of protein. I can honestly say after eating it along with a few Hail Merry Macaroons I wasn’t hungry for hours. This is weird for me! Beach sunsets never get old for me. I have probably seen hundreds of beach sunsets up and down the east coast and in Hawaii and all over the Caribbean but they always amaze me. This picture was taken at Fort Meyers beach as SL and I were walking down the pier. This shot doesn’t nearly do it justice but I thought it came out pretty well. Lately this has been my go to accessory. 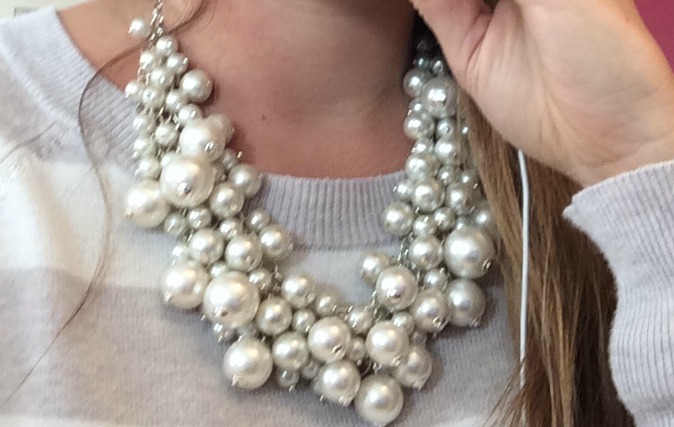 Maybe it’s because it goes with almost everything (hello…pearls obviously go with everything) or maybe its because I without fail get multiple compliments on it when I wear it but I have been loving this necklace lately. I snagged this beauty on Ebay for less than $10. Here is a very similar gold version. I love this version from Etsy as well. If you feel like breaking the bank a little, Neiman Marcus has a cute version too. Yesterday was my first day back at work after vacation and I really wasn’t feelin’ it. Pandora tweeted this out yesterday and I knew it would at the very least lift my mood. It did so much more…it made my day! This is such a great find for…brings my back to high school and middle school. Love these jams! I have a big weekend ahead that I will recap on Monday. Until then, peace and love my friends.